For the software development tool targeting the Symbian OS, see Carbide.c++. For the metallic compound commonly used in machine tools, see Tungsten carbide. For the town in West Virginia, see Carbide, Wetzel County, West Virginia. Lattice structure of titanium carbide. In chemistry, a carbide is a compound composed of carbon and a less electronegative element. Carbides can be generally classified by the chemical bonds type as follows: (i) salt-like, (ii) covalent compounds, (iii) interstitial compounds, and (iv) "intermediate" transition metal carbides. Examples include calcium carbide (CaC2), silicon carbide (SiC), tungsten carbide (WC; often called, simply, carbide when referring to machine tooling), and cementite (Fe3C), each used in key industrial applications. The naming of ionic carbides is not systematic. 3", in the sesquicarbides. The graphite intercalation compound KC8, prepared from vapour of potassium and graphite, and the alkali metal derivatives of C60 are not usually classified as carbides. Transition metal carbides are not saline carbides but their reaction with water is very slow and is usually neglected. For example, depending on surface porosity, 5–30 atomic layers of titanium carbide are hydrolyzed, forming methane within 5 minutes at ambient conditions, following by saturation of the reaction. Note that methanide in this context is a trivial historical name. According to the IUPAC systematic naming conventions, a compound such as NaCH3 would be termed a "methanide", although this compound is often called methylsodium. 2, explaining the metallic conduction. The carbides of silicon and boron are described as "covalent carbides", although virtually all compounds of carbon exhibit some covalent character. Silicon carbide has two similar crystalline forms, which are both related to the diamond structure. Boron carbide, B4C, on the other hand, has an unusual structure which includes icosahedral boron units linked by carbon atoms. In this respect boron carbide is similar to the boron rich borides. Both silicon carbide (also known as carborundum) and boron carbide are very hard materials and refractory. Both materials are important industrially. Boron also forms other covalent carbides, e.g. B25C. The carbides of the group 4, 5 and 6 transition metals (with the exception of chromium) are often described as interstitial compounds. 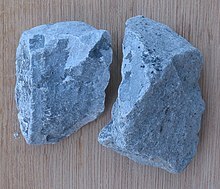 These carbides have metallic properties and are refractory. Some exhibit a range of stoichiometries, e.g. titanium carbide, TiC. Titanium carbide and tungsten carbide are important industrially and are used to coat metals in cutting tools. When the metal atoms are cubic close-packed, (ccp), then filling all of the octahedral interstices with carbon achieves 1:1 stoichiometry with the rock salt structure. When the metal atoms are hexagonal close-packed, (hcp), as the octahedral interstices lie directly opposite each other on either side of the layer of metal atoms, filling only one of these with carbon achieves 2:1 stoichiometry with the CdI2 structure. The following table shows actual structures of the metals and their carbides. (N.B. the body centered cubic structure adopted by vanadium, niobium, tantalum, chromium, molybdenum and tungsten is not a close-packed lattice.) The notation "h/2" refers to the M2C type structure described above, which is only an approximate description of the actual structures. The simple view that the lattice of the pure metal "absorbs" carbon atoms can be seen to be untrue as the packing of the metal atom lattice in the carbides is different from the packing in the pure metal, although it is technically correct that the carbon atoms fit into the octahedral interstices of a close-packed metal lattice. For a long time the non-stoichiometric phases were believed to be disordered with a random filling of the interstices, however short and longer range ordering has been detected. In these carbides, the transition metal ion is smaller than the critical 135 pm, and the structures are not interstitial but are more complex. Multiple stoichiometries are common; for example, iron forms a number of carbides, Fe3C, Fe7C3 and Fe2C. The best known is cementite, Fe3C, which is present in steels. These carbides are more reactive than the interstitial carbides; for example, the carbides of Cr, Mn, Fe, Co and Ni are all hydrolysed by dilute acids and sometimes by water, to give a mixture of hydrogen and hydrocarbons. These compounds share features with both the inert interstitials and the more reactive salt-like carbides. The complex [Au6C(PPh3)6]2+, containing a carbon-gold core. Metal complexes containing C are known as metal carbido complexes. 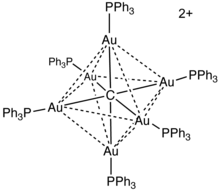 Most common are carbon-centered octahedral clusters, such as [Au6C(PPh3)6]2+ and [Fe6C(CO)6]2−. Similar species are known for the metal carbonyls and the early metal halides. A few terminal carbides have been isolated, e.g., CRuCl2(P(C6H11)3)2. 12 where M is a transition metal (Ti, Zr, V, etc.). metallacarbohedrenes(met-cars) which are cluster compounds containing C2 units. tunable nanoporous carbon, where gas chlorination of metallic carbides removes metal molecules to form a highly porous, near-pure carbon material capable of high-density energy storage. ^ a b c d e f g h i j k Greenwood, Norman N.; Earnshaw, Alan (1984). Chemistry of the Elements. Oxford: Pergamon Press. pp. 318–22. ISBN 978-0-08-022057-4. ^ O.O. Kurakevych; T.A. Strobel; D.Y. Kim; G.D. Cody (2013). "Synthesis of Mg2C: A Magnesium Methanide". Angewandte Chemie International Edition. 52 (34): 8930–8933. doi:10.1002/anie.201303463. PMID 23824698. ^ A. I. Avgustinik; G. V. Drozdetskaya; S. S. Ordan'yan (1967). "Reaction of titanium carbide with water". Powder Metallurgy and Metal Ceramics. 6 (6): 470–473. doi:10.1007/BF00780135 (inactive 2019-03-14). ^ Weiss, Erwin; Corbelin, Siegfried; Cockcroft, Jeremy Karl; Fitch, Andrew Nicholas (1990). "Über Metallalkyl- und -aryl-Verbindungen, 44 Darstellung und Struktur von Methylnatrium. Strukturbestimmung an NaCD3-Pulvern bei 1.5 und 300 K durch Neutronen- und Synchrotronstrahlenbeugung". Chemische Berichte. 123 (8): 1629–1634. doi:10.1002/cber.19901230807. ISSN 0009-2940. ^ Fjellvag H.; Pavel K. (1992). "Crystal Structure of Magnesium Sesquicarbide". Inorg. Chem. 31 (15): 3260. doi:10.1021/ic00041a018. ^ a b Peter Ettmayer; Walter Lengauer (1994). "Carbides: transition metal solid state chemistry". In R. Bruce King. Encyclopedia of Inorganic Chemistry. John Wiley & Sons. ISBN 978-0-471-93620-6. ^ C.H. de Novion; J.P. Landesman (1985). "Order and disorder in transition metal carbides and nitrides: experimental and theoretical aspects". Pure Appl. Chem. 57 (10): 1391. doi:10.1351/pac198557101391. ^ John Percy (1870). The Metallurgy of Lead, including Desiverization and Cupellation. London: J. Murray. p. 67. Retrieved 2013-04-06. ^ Y. C. Zhou; H. Y. Dong; B. H. Yu (2000). "Development of two-dimensional titanium tin carbide (Ti2SnC) plates based on the electronic structure investigation". Materials Research Innovations. 4 (1): 36–41. doi:10.1007/s100190000065.